André Prinsloo was born in Port Elizabeth in 1956. After graduating with a National Diploma and Higher National Diploma in Fine Arts from the Nelson Mandela Metropolitan University, he worked in the Sculpture Department of the South African National Defence Force for six years. He then moved to the University of Pretoria where he was employed first as a Technical Assistant and later as a lecturer in Fine Arts (Sculpture) as well as a lecturer at Tshwane University of Technology’s Entertainment Technology (props) department. 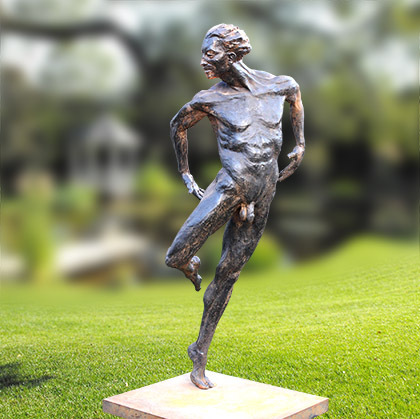 Throughout his adult life, André has been involved with sculpture or 3D objects in one way or another. Prior to 2012, however, his career as a sculptor was sporadic and he only took part in group exhibitions once every four years on average as he was working full-time either as a lecturer or, later, in running a small manufacturing business.